Even natural born charmers like George Clooney can have bad days; case in point, his latest directorial outing The Monuments Men, which was surprisingly removed from the current Oscar race at the last minute. However, looking at the final results, you can sadly see why. Underwhelming both as a historical drama and as a vehicle for Clooney and co-stars to shine on screen, everything about this film feels like squandered potential. It’s an interesting enough story set during a period that awards voters just adore, and features a very talented bunch of people on and off camera. However, none of them ever shine through here and we’re left with a depressingly bland and dull film that really could/should have been something good. Maybe the problems lie in its script, co-written by Clooney and Grant Heslov, which seems to prefer long-winded expository speeches rather than character development. This is a major problem, especially for something called The Monuments Men where we should expect to know more about who the titular group are instead of what they do. This results in none of them having any distinct personality or even chemistry with one another, and that leaves us not caring if and when something happens to them. If anything, the cast are just playing themselves if they were in World War II – for example, Matt Damon plays the captivating role of Matt Damon, while Bill Murray is cast in a multi-generational part as Bill Murray, and so on. The only member of the cast who at least tries to create a character is Cate Blanchett as a French museum curator, but even her accent becomes caricature after a while. All of the cast do fine for what material they have been given, but it’s not enough to raise this movie from the depths. Clooney, as a director, has shown strength with films like Good Night and Good Luck and The Ides of March, but here does not seem to have enough confidence or capability in portraying this true story on the screen. For a start, it never knows what kind of film it wants to be; a farcical caper movie or a hard-hitting war drama. So many of these comedy/drama elements come together so awkwardly that it doesn’t find a consistent tone to stick with, and it becomes unfocused and woefully misguided very quickly. None of this would really matter if it was strong in either approach, but it’s not really that funny nor is it emotionally gripping. We’d be surprised if there wasn’t a set of trading cards dedicated to how many pointless scenes there are that go absolutely nowhere and in no way drive the plot forward. At one point, Bill Murray and Bob Balaban – we know their characters have names, but are you really going to call them anything else? – are confronted by a young soldier with a shotgun, and nearly nothing happens for the entire scene. All tension is lifted when it becomes apparent that it’s being played for laughs, and it even ends on an anti-climax that frustrates more than it does satisfy. It reflects most of the movie too, which feels incomplete as soon as the end credits start rolling. None of the characters face any real conflict which makes us even less invested in the events, and hardly any of them seem to have gone through any personal transformations by their final scenes. On top of everything, however, is that it’s just boring. From what one hears, the real-life events that inspired this movie weren’t very eventful anyway and maybe that’s what Clooney was going for but that’s no excuse to not entertain the audience. Representing this kind of story on-screen requires a great deal of focus and confidence, and none of that is present in The Monuments Men. You can smile all you want, Clooney, but sorry; like the unexploded mine in one of its many pointless scenes, this one’s a dud. 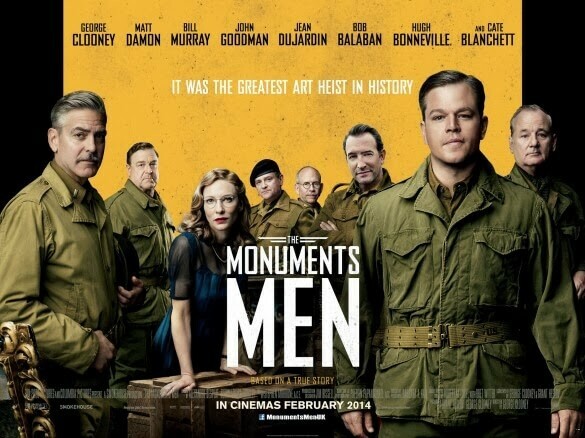 The Monuments Men is a giant waste of talent and potential that’s awkwardly displayed and unentertaining to the point where it becomes painful to sit through. All the actors do fine with their limited material, but unbalanced direction and uneventful writing bury this stinker into the ground where it belongs.